LAN Sync refers to a file synchronization approach that accelerates the sync process when a shared file or folder already exists on a Local Area Network (LAN). 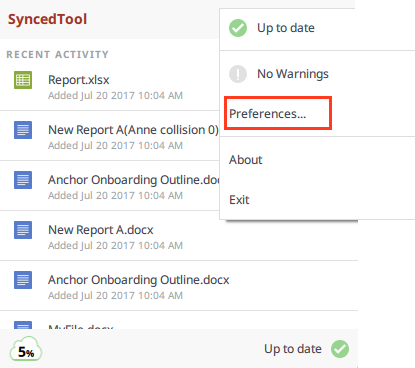 Typically, under a standard sync method, when a shared file is created, each subscribed device begins an individual sync process with the Anchor Server. With LAN Sync, when a new shared file is created, one desktop client will synchronize with the Anchor server, and all other desktop clients will synchronize from one another within the LAN. LAN Sync is a faster and more efficient process, and is particularly useful in environments with limited bandwidth. Note: LAN Sync requires that desktop clients are connected to the Anchor server; LAN Sync is not intended to support off-line mode. End users can turn on the LAN Sync option from the desktop client Properties dialog box on their local machines. These end users must also be connected to the Anchor server and operate within a Local Area Network. If bandwidth throttling is configured for a LAN sync-enabled machine, transfers between desktop clients within a LAN will not adhere to bandwidth throttling settings. Only transfers outside of the LAN (between agent and server) will adhere to bandwidth throttling settings . LAN Sync requires that desktop clients are connected to the Anchor server; LAN Sync is not intended to support off-line mode. Desktop clients must be operating within the same subnet or broadcast address. For example, in a typical office setting, all machines are connected to a single router, and are therefore operating within the same network (subnet). If a LAN uses multiple routers to extend its network, a LAN sync-enabled machine will operate within the network to which it belongs. LAN sync requires access to TCP port 16800 and UDP port 16800 to enable communication between desktop clients. The UDP port is responsible for sending data, and the TCP port is responsible for connecting to the recipient and delivering data. The TCP port is encrypted. Before LAN sync starts, inbound and outbound firewall rules must be configured to allow access to the appropriate TCP port and UDP port. Note: To prevent conflicts, please ensure that other applications are not using these same ports (for example, Skype). A desktop client will synchronize with the Anchor server. Desktop clients that need the file will synchronize from other desktop clients within the LAN. The new file will be distributed across the LAN. In some instances, the desktop client that synchronized with the Anchor server will distribute the file, and in other instances, multiple desktop clients will help with the distribution process. The exact process is determined by the load balancer. The new desktop client will synchronize files from other desktop clients within the LAN. LAN Sync desktop clients communicate with one another through TCP and UDP ports. The TCP port is responsible for reliable data transfer, and is encrypted. 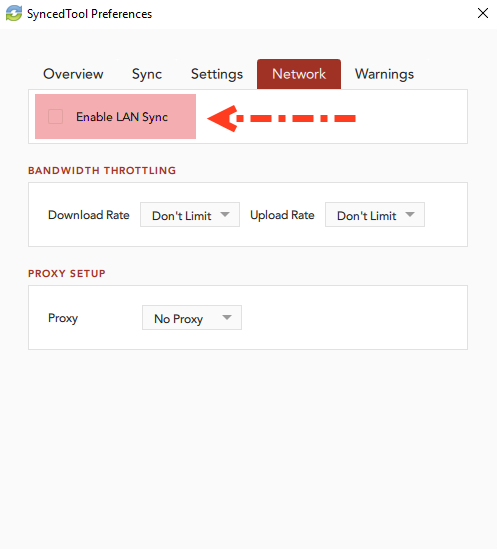 In the Network tab, click the Enable LAN Sync checkbox. By default, checkbox is unchecked. LAN Sync is now enabled for the desktop client.